After being hacked and deleting my account, I recently returned to Facebook. Just in time to build up my friends list for my birthday on October 1. Like many, I'm sure, I have a mixed attitude to Facebook. It was great getting all those birthday greetings. For a day, my name went to the top of the list of pending birthdays on my friends' Facebook pages. And I love sharing my blogging progress on Facebook. The but? The but is the amount of daily distraction.. I am not a gamer and my days of web surfing are long gone. But checking my FB feed has become a thing and the distraction bothers me. 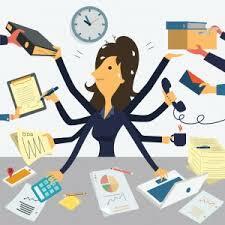 The multitasking myth has been on my mind of late. An article on multitasking by Olivia Goldhill, with the catchy title, Neuroscientists say multitasking literally drains the energy reserves of your brain, makes some great points. It's so good you should go read it RIGHT NOW! When we attempt to multitask, she says and I agree with her, we don’t actually do more than one activity at once, but quickly switch between them. And this switching is exhausting. It uses up oxygenated glucose in the brain, running down the same fuel that’s needed to focus on a task. Along the way she quotes Daniel Levitin, professor of behavioral neuroscience at McGill University. He found that people who take 15-minute breaks every couple of hours end up being more productive. But these breaks must allow for mind-wandering, whether you’re walking, staring out the window, listening to music or reading. “Everyone gets there a different way. But surfing Facebook is not one of them,” he says. Social networks just produce more fractured attention, as you flit from one thing to the next. She also quotes Gloria Mark, from the University of California, who says that when people are interrupted, it typically takes 23 minutes and 15 seconds to return to their work, and most people will do two intervening tasks before going back to their original project. Apart from a build up of stress, clearly focus has shifted BIG TIME. So - back to Facebook. It can destroy focus! But not just Facebook. Oh no! Online notifications on my iphone (yes I love my iphone) are bad too. That little chirpy ping that tells me a new Twitter follower has joined the ranks, or an email from Medium.com that just wants to alert me to some great articles (like Olivia's) takes me away from...what was I saying? She's found that after being frequently interrupted, people often develop a short attention span. What's that? Oh, you're welcome!